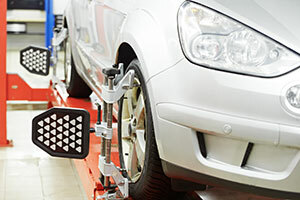 Wheel alignment should be a standard component to your regular Phoenix auto tune-ups and maintenance services. The process is relatively simple and can prevent a number of problems for you and your automobile in the future. Basically, upon contacting our team at Discount Brake Tune and Lube, an authorized Napa AutoCare Center for a wheel alignment, one of our certified technicians will inspect the angle of your wheels as compared with the manufacturer’s specifications. Uneven tire wear can be very costly. Uneven tire wear is when one edge (either the inside or the outside) is hitting the road and the other edge is not. This causes one part of your tire to wear out faster, while the other edge will still be ok to drive on. Unfortunately, if you have uneven tire wear you have to buy new tires. New tires can cost several hundred dollars each. It is better to call Discount Brake Tune and Lube to take a look at your alignment now before you have a problem. Remember, we won’t try to sell you, we want to help you so you trust us and come to Discount Brake Tune and Lube for all your auto repairs. Contact our wheel alignment experts for a perfect balance! At Discount Brake Tune and Lube, an authorized Napa AutoCare Center, we specialize in helping customers avoid unnecessary wear and tear on their vehicles. With properly aligned wheels, you can significantly extend the life of your tires – saving you money in the long run. For an appointment, contact us at (602) 667-3400. To schedule an appointment at our Casa Grande auto repair shop, call (520) 426-1500.